Prenuptial agreements are on the rise. Here‘s a Huffington Post article explaining this rise and the reasons behind it. A prenuptial agreement is especially important when it‘s not the first marriage for either or both of the members of the couple or where one or both of them have children from prior relationships. This is the situation when one spouse dies and the other remarries. Such an agreement overrides the default state law regarding the rights of a married couple. 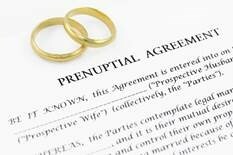 Typically, a prenuptial agreement covers the rights and duties of the parties during three time periods: during marriage, upon separation or divorce, and upon death. For example, the default state law may require 1/3 or more of a deceased spouse‘s assets go to the surviving spouse. The agreement could specify that the surviving spouse only has a right to some lesser share, such as 10%, or a specific dollar amount. This sounds simple enough. But, to be enforceable, the agreement must meet certain requirements, which vary by state. Each party should be represented by a different attorney. Each should have full knowledge of the other‘s income, assets, and liabilities, including any expected inheritances. The parties should have sufficient time to consider the draft of the agreement. It shouldn‘t be foisted on anyone while walking down the aisle to the altar, for example. When one spouse dies, they can leave their portion of the assets in a trust. They can then require that their surviving spouse enter a prenuptial agreement prior to remarriage if the surviving spouse is to continue as a beneficiary of the deceased spouse‘s assets in the trust. This helps protect the surviving spouse and the deceased spouse‘s children from claims from the new spouse. This also helps avoid any awkwardness for the surviving spouse. The surviving spouse can tell their new partner they really don‘t have a choice: they will be cut out as a beneficiary of their deceased spouse‘s assets unless they enter a prenuptial agreement prior to remarriage. This remarriage protection provides at least three benefits. First, it provides peace of mind for you during life. You know that your assets will go to whom you intend and not to your surviving spouse‘s new partner upon remarriage. Second, it helps to protect your surviving spouse. Just as you‘re leaving resources for your surviving spouse, this remarriage protection helps protect your surviving spouse from someone they might meet after your death, perhaps when they are most vulnerable. Third, this remarriage protection helps protect your children from any predation on the inheritance which you intend for them. Requiring a prenuptial agreement upon your spouse‘s remarriage can help you, your spouse, and your children.